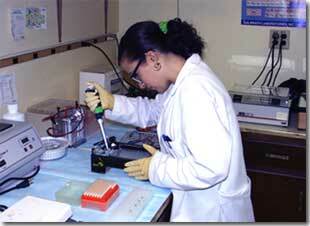 Research at EIC is conducted in its 40,000 sq. ft. facility in Norwood, Massachusetts. EIC maintains specialized laboratories for Raman/spectroscopic systems development, thin film materials processing, microbiology research, and general laboratories and extensive instrumentation for chemical and materials synthesis and analysis. Research and development of advanced thin film materials is conducted in a clean room, Class 100 facility housing deposition equipment and separate areas for substrate preparation and photolithography. 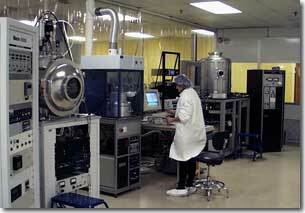 Specific deposition equipment includes two systems for rf and dc magnetron sputtering. One is a combined e-beam/sputter deposition system equipped with a 26" diameter water-cooled chamber capable of accommodating 20" diameter substrates. The second is a custom designed sputter deposition system equipped with a computer controlled in vacuo robotic stage. Deposition variables on both systems are microprocessor controlled. The facility also houses a chemical vapor deposition (PECVD) system. Thickness monitors, residual gas analyzers and multichannel optical plasma analyzers with ultraviolet spectroscopic capability are employed for process control for sputtering and PECVD. Facilities for chemical and materials synthesis comprise well-equipped laboratory spaces with multiple fume hoods, furnaces and inert atmosphere glove boxes. Analytical instrumentation includes atomic absorption, UV-VIS-NIR spectrometers, FT-NMR spectrometers, FT-IR spectrometers, Raman spectrographs, GC/MS, total organic carbon analyzers, particle size analyzers, HPLC and GPC chromatographs, thermogravimetric analyzers, differential scanning calorimeters, x-ray diffractometer, and electrochemical instruments (potentiostats, impedance analyzers, corrosion analyzers). A scanning electron microscope equipped with EDAX and digital image processing is available for materials characterization. Research and development on spectroscopic and Raman systems is conducted in two darkened, controlled environment laboratories with honeycomb vibration isolated tables for optical experimentation. This facility houses a variety of spectrographs, many of which have been designed and fabricated at EIC. 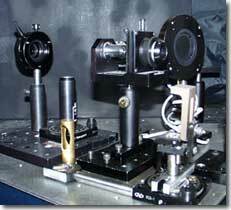 Laser sources at various excitation wavelengths and powers ranging from the NIR to the UV are maintained for Raman and laser induced fluorescence spectroscopy. EIC supports a laboratory for assembly of specialized fiber optic probes and an extensive collection of optical and electro-optical components. Apparatus for several specialized spectroscopic measurements are available, including Raman optical activity, optical limiting, high optical density measurements and UV resonance Raman. Research is carried out in a modern molecular biology/microbiology facility equipped with instrumentation for handling both mammalian and bacterial cell growth. Major equipment includes a biosafety cabinet class II A/B3, CO2 incubator, phase contrast and inverted microscopes, fluorometer, -86°C freezer, refrigerator, high performance centrifuge and rotors, speedvac, orbital shaker, PCR thermocycler, incubators for bacterial growth, shaker tables, autoclave, sonicator, water baths, and a full range of instrumentation for DNA and protein electrophoresis including a photodocumentation system linked to a computer. Analytical instruments include Raman, fluorescence, UV-VIS, FTIR, FT-NMR, GC-MS, x-ray diffraction, and HPLC/GPC. In addition, a state of the art spectroscopy facility contains a broad selection of laser sources and CCD cameras for imaging and other applications. Prototyping of cylindrical, prismatic and flexible polymer electrolyte lithium and lithium ion batteries is conducted in two dry rooms (250 and 1000 square feet). Lithium battery and nonaqueous electrolyte research is conducted in single and double inert atmosphere boxes. Battery assembly equipment includes electrode winding and welding machines. EIC maintains over 100 computerized stations for evaluating battery characteristics, long-term rechargeability, failure modes, and safety. Prototype Design and Fabrication: EIC supports an engineering organization for prototype design by mechanical engineers/draftsmen, for machining and for electronic and optical design and assembly. EICs mechanical, optical and electronic technicians are experienced in prototype assembly, including necessary in-process and final quality control requirements and test procedures. EIC Laboratories has an in-house machine shop equipped with a lathe, milling machine, drill press, and some metal working equipment. Security: EIC Laboratories and several of the key personnel have a security clearance at the Secret level should this be required for the military. All information and images contained in this web site are Copyright © 2004 EIC Laboratories, Inc. All rights reserved.